Sam Lloyd is staying strong! The Scrubs alum has been diagnosed with cancer. The ABC and NBC show creator, Bill Lawrence, revealed that a GoFundMe page has been created in order to pay bills for the actor's treatments. Sources confirmed the fundraising campaign's validity on Tuesday, February 5. The goal of the GoFundMe campaign is $1000,000. 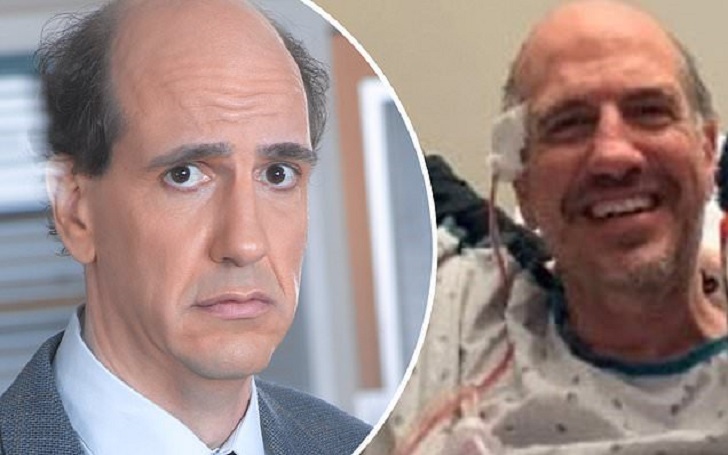 By all accounts, 2019 was off to a roaring start for our dear friend, Sam Lloyd. He and his wife, Vanessa, had recently welcomed their first child, a beautiful boy named Weston to the world. The musical that Sam had been working on for over a decade had just been accepted into a prestigious theatre accelerator program,” reads a description for the page. “There was so much to be grateful for… Midway through January, Sam began to experience headaches and he had lost 10 pounds. The television personality "figured the headaches were caused by the lack of sleep". However, according to the campaign’s description, he sought medical advice in mid-January "as his headaches grew stronger". The doctor thought the pain might be sinus-related so he ordered a CT Scan. The scan revealed a mass on Sam’s brain. Within a day, he was in brain surgery. Unfortunately the tumor was too intertwined so the surgeons couldn’t remove it. By Sunday, Sam and Vanessa were informed that the cancer in his brain had metastasized from his lungs. Further scans showed the cancer was also in his liver, spine and jaw. In the face of this devastating news, Sam and Vanessa have been incredibly strong and positive. Humor and laughter, which have been a huge part of Sam’s life, will undoubtedly help him with what lies ahead. More than $32,000 out has been donated to support the actor, 55, As of Tuesday, February 5. Bill set up the GoFundMe page, which has since been by Zach Braff, Donald Faison, John C. McGinley and Busy Philipps. Sam portrayed Ted Buckland on Scrubs from 2001 to 2009. Are Pippa Middleton and Husband James Matthews Expecting Their First Child?